You guys, can I share one of my favorite things about being a food blogger? I love without a doubt, the people, everyday life, and memories food blogging brings about. I love that it isn't just because of me- but through everyday experiences and chats, ideas are born. I love living my life, with people, doing our everyday things...and having food ideas and talks happen naturally. "Mmmm this would be so yummy as a _____" is usually how those types of things go. Take this sweet potato pie. This wasn't 100% my idea. Actually, it was developed a few months back, while dishes were being done after Thanksgiving. Neat huh? A simple, everyday experience turned into blog post. You see, it was after that dinner that my mother-in-law and I were cleaning up and chatting. As she was portioning out the leftovers for all the guests we started talking about (first off, how stuffed we were) how yummy certain things would be, as a pie. Yeah, we had just finished eating, but still had room to talk about more food. Ha! That eventually lead to talks about sweet potatoes and how one of my favorite things about Thanksgiving is the baked sweet potato/yam dish covered in puffy golden marshmallows my family does. I can't help it. Take a can of yams or sweet potatoes, drench them in brown sugar and then cover them in more marshmallows than probably needed and bake it?? You've got a friend for life, here. I want so many marshmallows that they're falling off the sides and burning on the bottom of your oven as it's baking. I want them crispy and crunchy on the sides and gooey in the middle. If the ratio could be more marshmallows than veggies, that's actually even better. MmMmMm! Anywho, that then lead to how much I actually covet and adore her version as well. Although not as marshmallow covered, it's amazingly amazing in itself and one of my favorite things at my husband's family's table. She makes one delicious version! She uses real sweet potatoes versus the canned, tops with a higher ratio of butter and brown sugar and way less on the marshmallow side. But golly, it's just as good and I look forward to it every year. But she knows this...I've told her many times before. So there we are, chatting away about how yummy it is, when we started drooling about how amazing the dish would be, made as normal, but then puréed into oblivion and baked into a pie. A Thanksgiving-dinner-staple-now-turned-dessert-pie. "Holy cow, could you imagine if you took this whole thing...and all it's saucy stuff and caramelized bits and like...baked it into a pie shell and topped with something yummy?!" As a tiny homage to my mother-in-law, here is a new version of my usual Sweet Potato Pie, vamped up with her most delicious roasted sweet potatoes as the base, and then topped with like 4 gallons of marshmallow fluff. You know, for kicks. Preheat oven to 350°F. Wash, dry and peel your sweet potatoes. Cut into large chunks and place in a glass baking dish. Place cubes of butter spaced on top the potatoes and top entire thing with an even layer of brown sugar. Bake until sweet potatoes are fork tender- 30-40 minutes, depending on how large your chunks are. Let cool completely. Preheat oven to 350°F again. Into your food processor with your puree, add your eggs, evaporated milk, lemon juice, vanilla, salt, nutmeg, allspice, cinnamon, and cardamom. Puree together until completely smooth. Pour filling into unbaked graham cracker crust; smooth top with a spatula. Place pie on a baking sheet, and bake until filling is set, 40 to 50 minutes. **If crust is browning too much and pie isn't finished baking, you can carefully cover edges of crust with tin foil to help slow down browning process.You're looking for the custard to be set and barely jiggling in the very center. Transfer pie to a wire rack to cool completely, about 2 hours. This pie can also be baked up to a day ahead and covered and refrigerated overnight. Turn on your oven's broiler. Allow to warm up for a few minutes and get nice and hot. Place pie onto a sheet pan once completely chilled. If in fridge, remove, and gently blot off any liquid that may have formed on the top, with a paper towel. Empty entire tub of marshmallow fluff onto the top of your pie, and carefully spread out so it covers entire top. Place pie, on sheet pan, under broiler and watch closely! This can burn very easily! Every few minutes spin the pie to ensure even browning. Your pie is done once entire topping has browned evenly! **Pie can also be baked in advance, cooled as directions instruct, then wrapped well with plastic and then tin foil. Place in freezer for up to a week! Then defrost overnight in fridge and finish with your marshmallow fluff right before serving. Food memories rock! 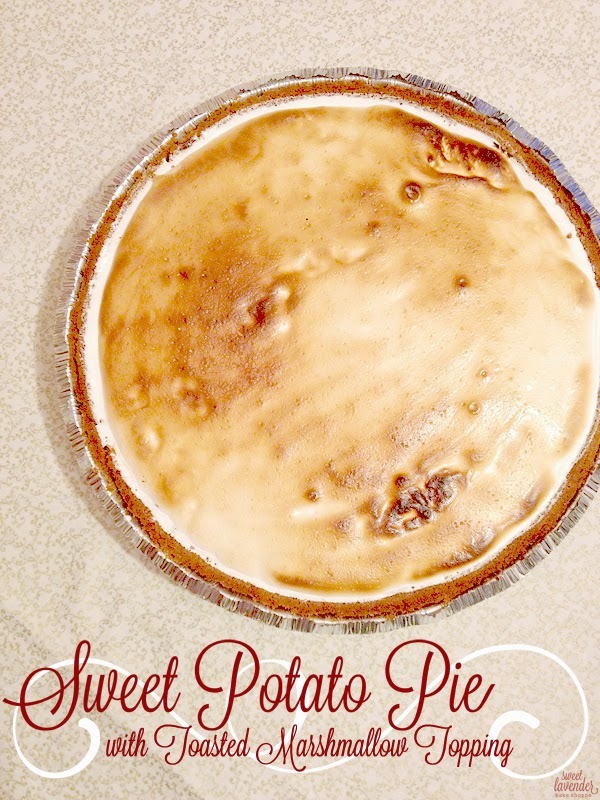 PS- thinking this would be DELICIOUS as a Valentine's Dinner dessert for your loved one! YUM! I am going to save this for my best friend's birthday - she will be so excited! Thanks for sharing! this will be perfect for my small group in two weeks! !